About once to twice a month, I will be sending out a flyer that encapsulates the great things going on at ELM. This is condensed version of what I send the staff. I want our community to get the same message... we are here for kids! What an exciting first full week back. I visited several classrooms and saw students engaged in a variety of thoughtful and challenging learning experiences. 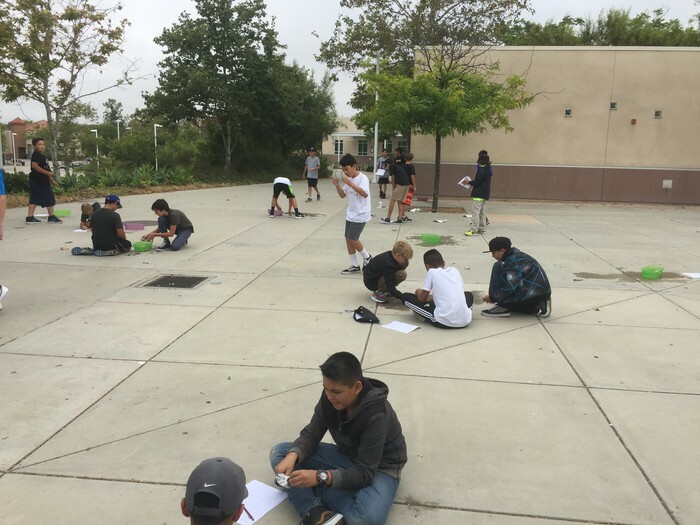 From OPTICS in History to the Penny Boat Challenge in Technology to the creative Oreo carving art project, Tritons were definitely learning at high levels. 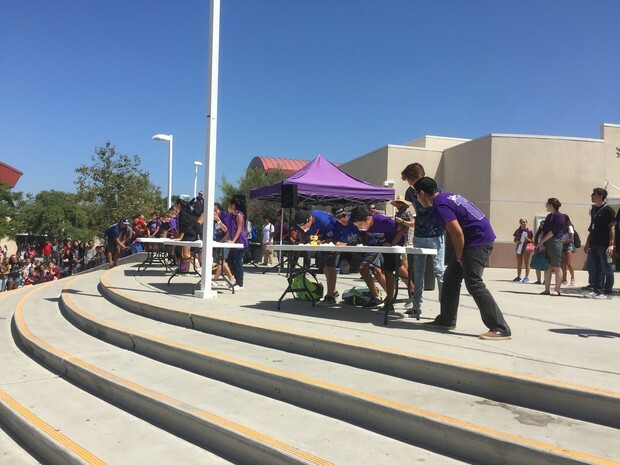 On Friday, we had an amazing spirit day with the students. I was proud to see so much purple out there! I would like to give special thanks to Alejandra and Frank for their presentations to the 7th and 8th graders regarding the Triton Way as well as Molly Bulwa for orchestrating a great first spirit day. I am in the process of visiting more classes and trying to recognize our staff. If you have a great story about one of our staff members, please send me an email. A little love goes a long way with educators! Our students were challenged to create a boat that could hold the maximum amount of pennies. Students used creative thinking and had a lot of fun! Our students had chance to show their art skills by carving out designs into an Oreo. And yes, they got to eat their art! 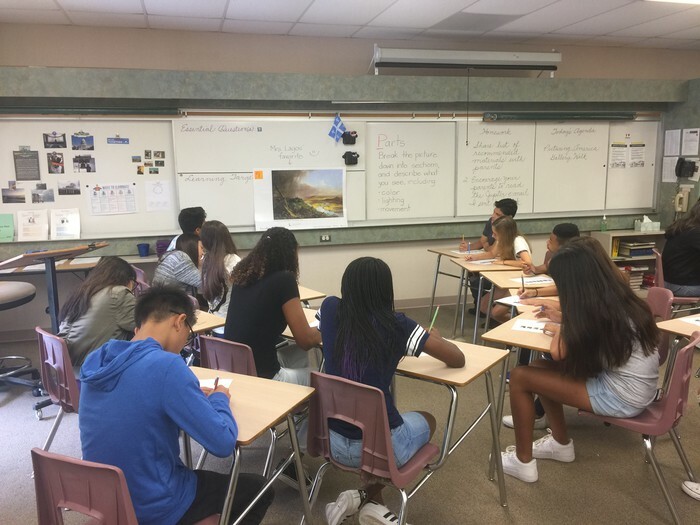 US History students had a chance to collaborate on understanding history through visuals! Ms. Bulwa will be sending direct calendar updates to those who have signed up with an email in Infinite Campus. Otherwise, please check our website every Monday for updated events. * The PTSO is reaching out for new members and leaders! Please consider coming to the first PTSO meeting this Tuesday Night (August 1st) at 6:00 PM in the library. Learn about last year's leadership team and meet some awesome parents doing great things for our great kids! Applications are on our website. 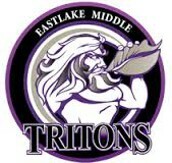 *The Eastlake Education Foundation has always been a great source of support for our school. Please check out the ELM website for more information about how to get involved with there awesome community events. *The first Coffee with Cooke is on August 15th at 9:00 AM in the library. Please grab a cup of joe and let's talk about your questions, concerns, and/or comments. *Does your student love sports? Check out the website for team tryout and clearance packet information. *The library is open before (7:15) M-TH and after school (3:20 to 4:20) M-F for a quiet study place. 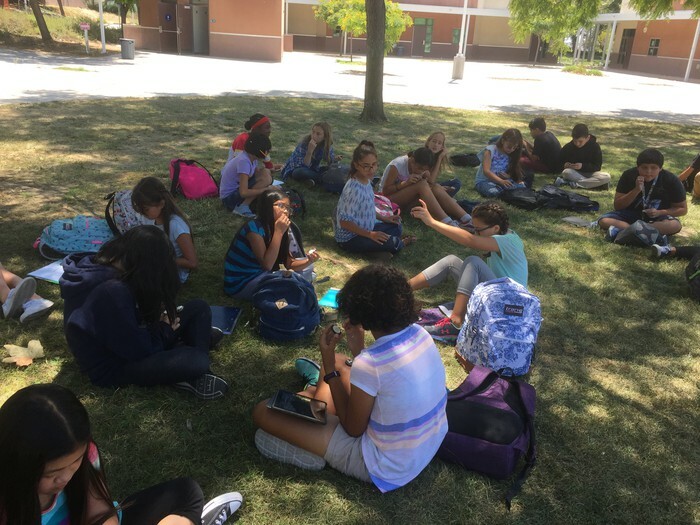 *ELM is in the process of balancing all of our classes to meet contractual class sizes. In some cases, we will need to change student schedules. We realize how difficult this might be for your student and want to assure you that we will do our best to minimize changes. We apologize that we cannot accommodate requests for specific teachers, class periods and/or other similar preferences. We understand your concerns and please note that we are doing our best to provide your student with smaller class sizes to ensure a positive and productive learning environment while meeting our contractual obligations. Please note that in the event of enrollment or staffing concerns, we reserve the right to close classes as needed. Again, thank you for consideration and understanding in these matters. Are you interested in more leadership opportunities that directly affects our students? Please consider joining the School Site Council. Contact Courtney Quinn (our CIS Coordinator) for more information. There is a Parent Involvement Night this Thursday, August 3rd, in the pavilion from 6-7 PM. This is a great opportunity to learn how to become more involved! This week, I had a chance to see Mariah Carey and Lionel Richie in concert. What a great concert. Both are extremely talented. Here are three songs to make you think about life. Hero -- Mariah Carey. It goes without saying, you make a difference. Keep shining for your student. Dancing on the Ceiling -- Lionel Richie. Let your exuberance shine through in all that you do! So... DANCE! Easy Like Sunday Morning -- Lionel Richie. Take time for to enjoy your loved ones and your passion. Be flexible and stay positive. Can't Hide That Purple Pride! 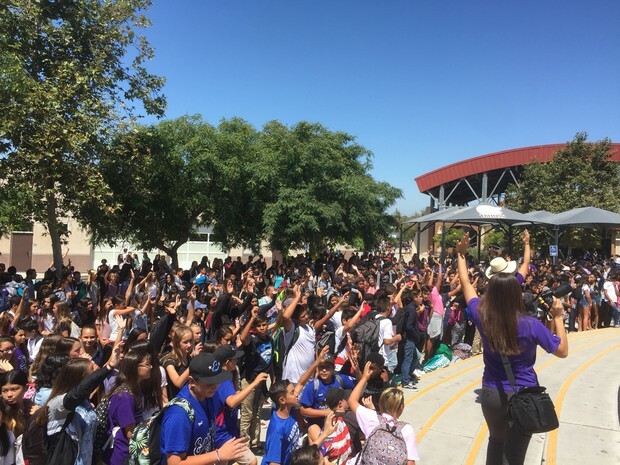 Look at all of those hands up wanting to participate!